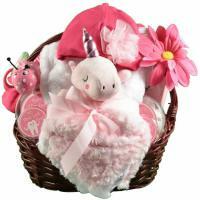 New baby gift baskets to celebrate the birth of the newborn baby girl or baby boy. 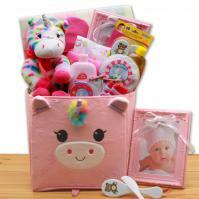 Adorable baby gifts designed to welcome the new baby and congratulate the parents. The world’s gone baby mad! But in the midst of all the excitement and celebration, it can be tricky to find a suitable gift to welcome the new arrival. Take the guesswork out of this situation and opt for a gift basket. With so many options available, you can be sure to include everyone in your thoughts and deeds. Whatever the new addition requires can be catered for in a gift basket. From traditional congratulatory floral arrangements to baby toys and useful baby products, the range is almost endless. Popular choices include the welcome home baby basket, which offers the best of both worlds – a beautiful tree in a baby box, accompanied by “must-have” items such as onesie, receiving blanket with matching hat and hypoallergenic baby toiletries. There’s even a rubber duckie cookie for the new parents to enjoy. Another best seller is a pail full of organic reusable burp cloths – an essential item for any new arrival. These are beautifully presented and made of sustainable materials, so kind to the environment too. While both parents obviously deserve congratulations, we think Mom deserves some special relaxation all of her own. New mother gift baskets mean you can treat the lady of the moment to a bit of indulgence, after those long months of pregnancy. A huge number of pampering baskets are available, bulging with relaxing treatments and sweet surprises. New moms will love the chance to grab a little “me time” and turn their bathroom into a haven of peace and tranquility. 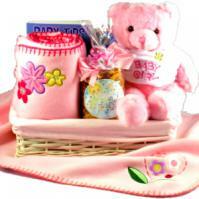 Baskets are also available which cater for Mom and Baby – so combining luxurious spa products for Mom and commemorative items for your baby including a molding kit and keepsake container for Baby's first handprint, a molding kit and keepsake container for Baby's first footprint, an adorable baby frame and a 6 1/2 inch soft chenille animal rattle. And if Dad is feeling a little left out, don’t worry; there are baskets just for him too! 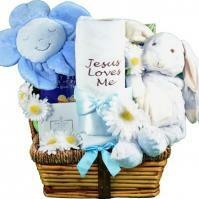 With so many baby baskets available, you really will be spoilt for choice. All styles, budgets and with speedy delivery included, you’ll know that the new parents won’t have to wait too long for this arrival!